I recently bought a couple of Derwent products to add to my Adult Colouring Materials, and I thought I would do a little review of them. These include Burnisher and Blender set and Super Point Mini Manual Sharpener. I also have the Derwent Artist Pencils 72 Pack and a Derwent Electric Eraser, which I would like to show you as well. I have heard good things about the Derwent blending pencil and was excited to finally come across it in my local art store. The pack includes the two burnishing pencils, two blender pencils, an eraser and sharpener. The blender is used to blend colours together or give a smoother appearance. The burnisher gives a glossy sheen to the pencil. I found that both pencils worked really well with my Derwent Artist pencils. I also tried them with both my Polychromos and Prismacolor pencils and was happy with results. These pencils are a bit harder then a Prismacolor blender so you do have to take care when using them. The little eraser that is included is also quite good for removing most of the colour if you make a minor mistake. 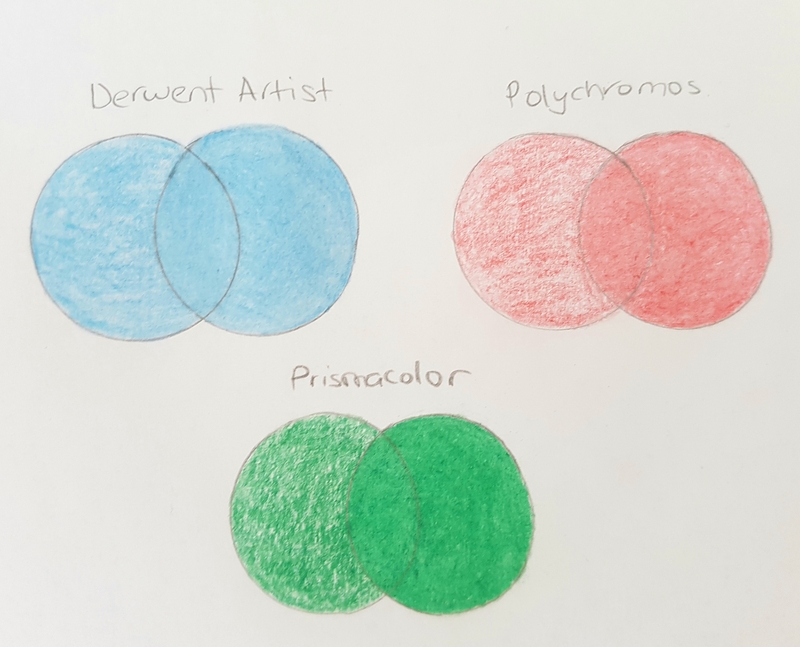 Here are some examples of how the blender and burnishing pencils work with Derwent Artist, Faber-Castell Polychromos and Prismacolor Premier pencils. I only did a couple of layers using light-medium pressure. In the second circles I have used the blender pencil and in the middle section, I used the burnisher. It’s hard to see on camera, but the middle second has a nice sheen to it. I go through sharpeners so frequently. It doesn’t seem to matter how much I spend on a manual sharpener, the blades dull within a month. So I thought it was time for something a bit stronger. On a few recommendations, I decided to buy this Derwent Super Point Mini Manual Sharpener. When I first got it I was not happy with it. I didn’t seem to do anything. Silly me was not using it properly. The sharpener needs the face pulled out and the pencil placed all the way in. Now I know how to use it correctly I am very happy with it. It gives a nice long sharp point. I found that I sharpened my pencils a lot less and of course got a lot more pigment out. It worked well for my Derwent Artist and Faber-Castell Polychromos pencils. However, I do not like it for my Prismacolor Premier pencils. Although it can give the same long sharp point I found that these soft pencils chip and the core wobble when I used them. 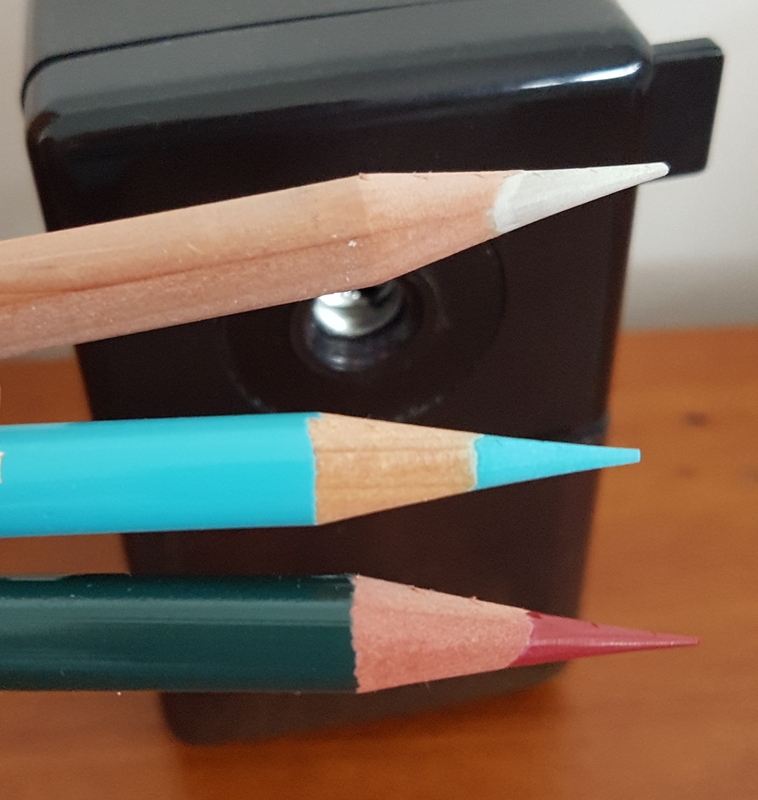 I’m not sure if it’s because my pencils cores have been weakened from transportation or dropping but the space between the coloured core and the wooden barrel seemed to make them very fragile and prone to breakage. Here you can see my Derwent Blender, Faber-Castell Polychromos and Derwent Artist pencils. The sharpener has given them all a nice long sharp point. They vary in pointiness due to how long I sharpened them for. I originally bought the Derwent Studio Pencils, which come in the same shades but are more for sketching. Once I realised my mistake I donated those pencils to my nieces and bought this pack. I don’t use the Derwent Artist Pencils very often, but I do use them for Peta Hewitt (La Artistino’s) colouring video tutorials, in combination with Faber-Castell Polychromos pencils. These pencils are softened than the Derwent Studio, but they are still quite a hard pencil. They are quite pale in pigment and are better for layering. However, you should apply colour very lightly as once you go in too hard it is nearly impossible to add more colour over the top. They also can imprint on the paper if too much pressure is used. I don’t love these pencils, but they are handy to have for more colour options and do blend well with Polychromos pencils. They can also be bought in open stock. Below is the colour range for all 120 colours. The whole range is only available in the wooden box. I bought the 72 tin, which is ready available. I never really knew how much I needed this Derwent Electric Eraser until I got it. It really is fantastic. It can get into tight spots and takes off a fair bit of pigment from the paper if you make a mistake or go out of the lines. It is also great for creating light effects, by lightening areas. The eraser comes with a little bag of refills, but another bag of refills are quite cheap. The only thing I had to watch was that I scratch the paper with the metal holder, once the eraser had worn down. This really damaged my paper. This eraser works well for all my pencils. Here are some examples of how this eraser worked on Derwent Artist, Faber-Castell Polychromos and Prismacolor Premier pencils. I did about three layers with medium pressure before using the eraser. So you can see it removed quite a bit of pigment, especially for the lighter colours. So if you are just making minor mistakes when using light pressure, that can practically be removed completely. However, for darker colours, you can get quite a bit of colour off the paper and if you are going over with a different shade of colour you shouldn’t notice the difference. This picture is from Hanna Karlzon’s Summer Nights (Sommarnatt). I coloured it with Derwent Artist Pencils and used the Burnisher, Blender Pencils and Derwent Eraser (from this set). I also used White Uni-ball Signo Broad Gel Ink Rollerball Pen for lines, dots, and stars; few Costco Point & Line Gel n’ Roll Ink Pens for the jewels, jewellery and eye; and Faber-Castell Black Brush Pitt Pen for the internal background and bat’s eye. The Derwent Artist pencils are quite hard, so I had to be very careful use minimal pressure on the paper. I was about to get 4 to 6 layers down, using little to medium pressure. However, where I did press a bit harder it became harder to lay more colour. Although the colour pigment is quite pale in comparison to other artist quality pencils I was happy with the overall effect. I would prefer to use these pencils with Faber-Castell Polychromos, as they are able to blend well with these vibrant coloured pencils. I decided to not try a galaxy background or shimmering jewels with these pencils because I really didn’t think they had enough pigment pull it off. The blender pencils helped to blend the colours and remove any white speckling. The burnisher also gave the picture a bit of a glossy sheen, which is more noticeable in person. Derwent!! Brings back lots of nice childhood memories. These products are a lot more sophisticated though . I love your colouring of the bat picture. Thanks so much Lyn. Yes the world of colouring opened my eyes to all these amazing products I used to overlook in the art stores.